There are a few things that I use to understand the Bible. Firstly, whatever I read, I recognize that the Cross of Jesus Christ is the dividing line between the Old and the New covenants, and apply the effects of the Cross to every passage. Secondly, I always compare scripture with scripture, to help understand the audience and the context of any passage by seeing how the phrase was used elsewhere. 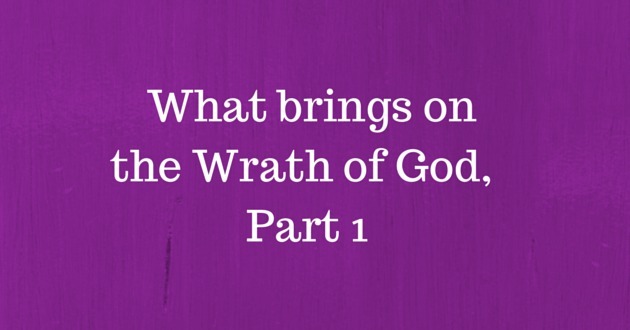 In light of the Finished work of the Cross, a topic that comes up often is the subject of the Wrath of God. Some have accused me of saying that I don’t believe in the wrath of God, which is unfounded and untrue. I very much believe in the wrath of God, and I also see very clearly in the Scriptures who the wrath of God is directed towards. Some have argued that if all sins are forgiven, why is there wrath in the Book of Revelations, which they believe is held out sometime in the future. There are actually many of these questions that I had to deal with in my own study on the subject of Grace and on the matter of the End Times. While I do not claim to have all these matters figured out, I definitely understand some clearly defined things concerning the Wrath of God. There is an often overlooked passage in the book of Deuteronomy that has huge significance upon this subject of wrath. The chapter is Deuteronomy 32, also known as the Song of Moses. The story goes, that as Moses is about to hand over to Joshua before his death, and the people were about to enter the land of Canaan, Moses calls the elders and prophesies over the Children of Israel of how this covenant they have just entered into is going to end. The passages is littered with Apocalyptic language of destruction, describing how God was going eventually enforce his part of the covenant that included all the punishment for the Children of Israel’s disobedience. Passages like Deuteronomy 32:22, which speak of the untold torrents of wrath that God was going to unleash upon Israel. Or Deuteronomy 32:32, where God describes the future state of Israel to the likes of Sodom and Gomorrah. Or even the passage Deuteronomy 32:25, that talks about God unleashing indescrimentant mascare of everyone, the old, the young, the virgins and even the elderly. This is the context of which the Bible speaks about, concerning the Wrath of God. The judgement described in Deuteronomy 32, is not a world wide wrath upon all people. Instead it is a very spefic judgement upon Israel. The reason it is specific is because Israel was the only people-group that had a Covenant with God, that entitled them to be punished if they disobeyed the Laws (Deuteronomy 28). And we know, that Israel was in disobedience from day one, with a Gold Calf (Exodus 32:24). This coming wrath, was warned about continually through the prophets described as the coming day of vengeance of the Lord. (Jeremiah 46:10, Joel 1:15, 2:31, Malachi 4:4-6, Isaiah 13:6, 61:2). In fact, Malachi 4:4-6, paints a very clear picture of the timing of the dreadful day of the Lord. It is said to happen shortly after John the Baptist and Jesus Christ, had come to turn the people of Israel back to the Lord. Malachi 4:4-6 Remember ye the law of Moses my servant [Jesus], which I commanded unto him in Horeb for all Israel, with the statutes and judgments. Behold, I will send you Elijah the prophet [John the Baptist] before the coming of the great and dreadful day of the LORD: And he shall turn the heart of the fathers to the children, and the heart of the children to their fathers, lest I come and smite the earth with a curse. In my next article we will examine: the context of Wrath going into the New Testament from Jesus to Paul. The Wrath of God – Pieter Swart.